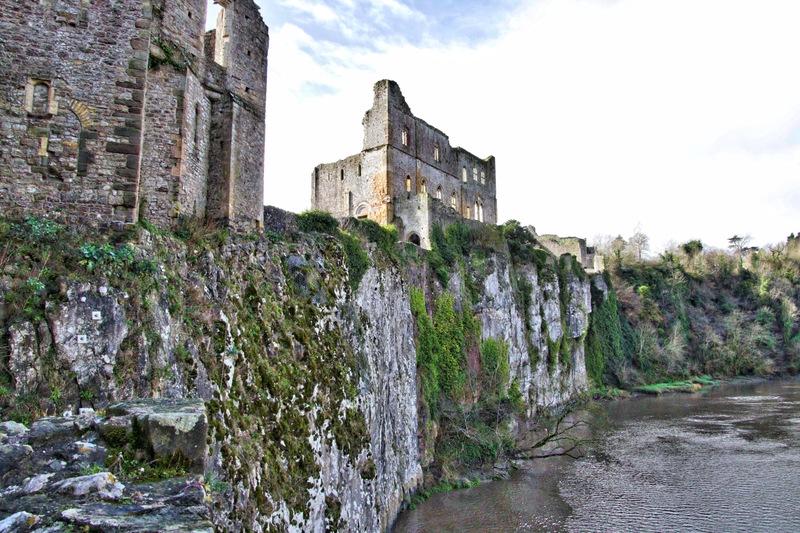 Perched on the edge of a precipitous cliff overlooking the River Wye is a fantastic castle. And when the sun shines the view over the river towards the majestic walls cannot be ignored and you just have to explore it, climbing towers, peering into dark recesses and tower dungeons. Like any kid who is over 50 years old, I love castles. But of course when I took this photograph the sun wasn’t shining, but that didn’t spoil a great morning. Though it did rain hard later and luckily there was pub near by which not only served great beer but also a fantastic home made steak pie – heaven. But don’t tell Aunty, she wasn’t there. It was a boys day out with Grandad. Less than a year after William the Conqueror was crowned King of England, William FitzOsbern the Earl of Hereford turned his beady eye towards the rich farming land along the coast of South Wales. 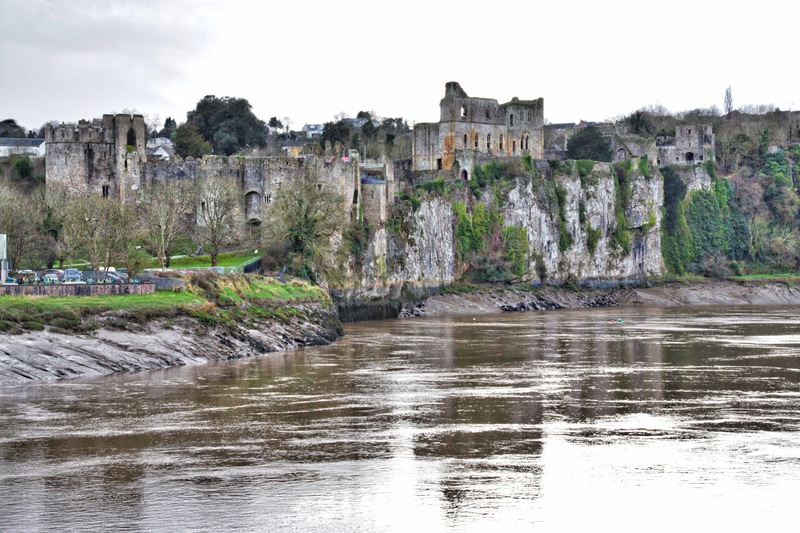 So in 1067 he moved across the River Wye and started building Chepstow Castle. This is not only great photogenic site (perhaps he appreciated the aesthetics of making a dramatic stand), but also a strategic point as he now controlled the entrance to the River Wye and the harbour, as well as access to the Severn Estuary. Although the Normans moved into South Wales quickly, it wasn’t easy for them. A simple look at the map will show you the number of castles they had to build to keep control of their conquests. And it took almost 300 years to complete a sweep throughout Wales. 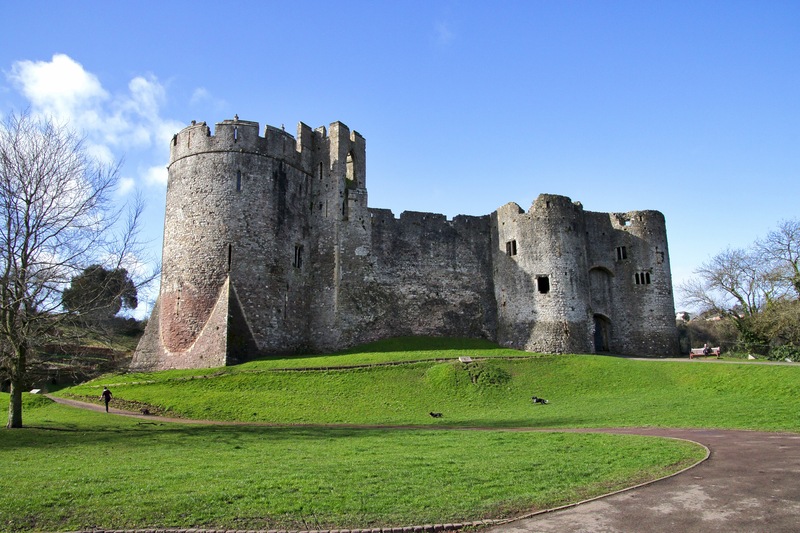 There are over 600 castles recorded in Wales, the highest concentration of fortifications anywhere in the world, but there are only 100 or so that are still physically visible today, though the remains of the others can still be worth hunting out. The castle isn’t your usual square fortification that kids draw with towers at each corner. It occupies a long, narrow ridge on the southern bank of the River Wye and is separated from the town by a deep gully known as ‘the Dingle’. It was enlarged and refortified a number of times over the years by some of the most powerful men of their times. 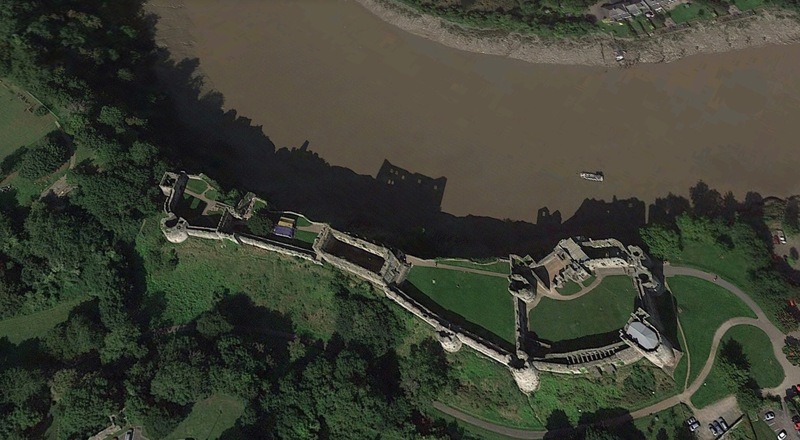 The image from Google Earth shows how it follows the cliff and the Wye on one side with much higher and stronger walls on the landward side. The walls on the river side have large windows, even then then Lords and Ladies liked a good view. Though on the town sides the walls are bereft of windows and only arrow slits are visible. Wandering around earlier parts of the castle you can’t help but notice red tiles built into the walls. It turns out these are roman tiles form nearby Caerwent, the Roman city of the Silures tribe. The local Welsh wide boys must have driven up with their cart and said “Here Butty, do you want to buy some tiles?”. “How many have you got?” asked FitzOsbern. 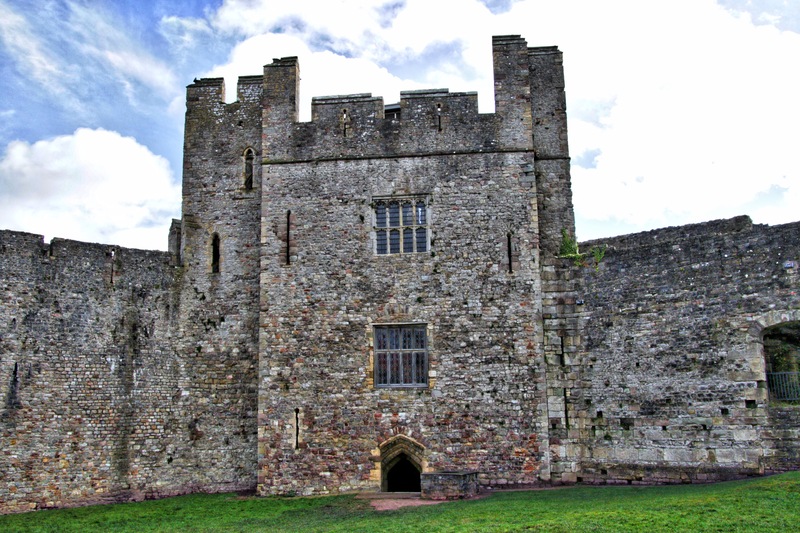 However, unusually for such a solid and functional building designed to suppress the locals and also to protect those in charge, Chepstow was occupied for a considerable time. Many castles fell into disuse, or were deliberately spoiled by the monarchy of the time to prevent them becoming a focus of resistance. As ownership changed through the vagaries of marriage, dowries and rebellion, Chepstow saw investment in it’s defences and usage. As the threat of rebellion from the Welsh subsided, domestic buildings were added at the end of the thirteenth century and continued to be lived in up to the civil war. I’ll not spend time here on a full history of the castle, there are others who can do this so much better than I can. But in a potted version after FitzOsbern, it passed to the de Clares another powerful family in the Welsh Borders. Following marriage between Isabelle de Clare and William Marshall in 1179 the castle was extended over a 30 year period. The castle was inherited by John Bigod, but on his death, all his lands, including the castle, were bequeathed to the Crown to pay his debts. Edward II appointed royal constables to oversee the castles; one was the hated Hugh le Despenser, who carried out some repair work on the infrastructure. Queen Isabella’s forces captured the castle in 1326 during another of the seemingly interminable civil wars of the time. Thomas de Brotherton took ownership and eventually, in 1399, it was in the possession of Thomas Mowbray, Duke of Norfolk. Throughout Owain Glyndwr’s uprising the castle wasn’t threatened and was only manned by twenty men-at-arms and sixty archers. 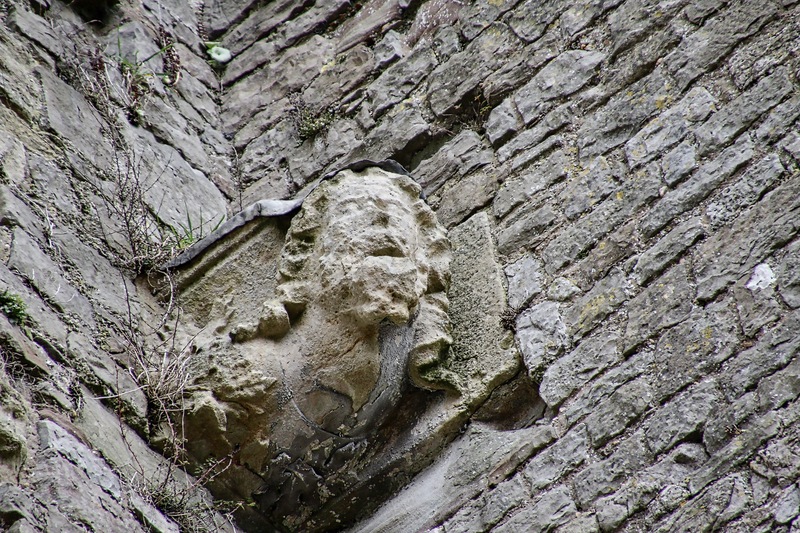 In 1405, Thomas Mowbray was executed for treason and the castle was taken over by William Herbert, who was Lord of Raglan and the Earl of Pembroke. Now the Pembroke family were stanch Royalists and during the Civil War held the castle for the Crown. Much of Wales was Royalist, though I’m not sure if this related to the general public or just the landholders who couldn’t see any profit for themselves to join the revolution. By 1643, the Parliamentarians had made significant gains throughout the country, and the family seemingly panicked and abandoned the castle and town in April. 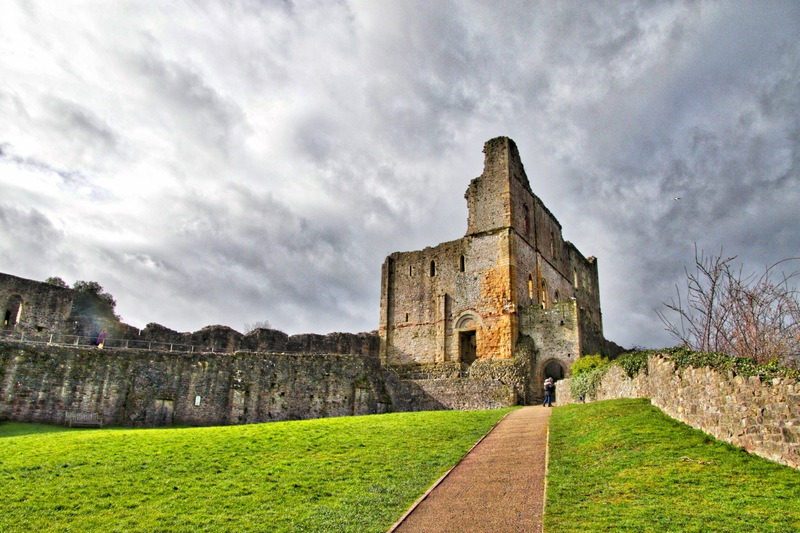 Later the King’s army reoccupied the castle, but while the Parliamentarians prepared to besiege it, the Royalists attacked their stronghold at Monmouth. The Parliamentarians abandoned the siege to relieve Monmouth. By 1645, the Royalists were more or less beaten and Chepstow Castle fell to a token force. During the Second English Civil War, Sir Nicholas Kemeys and 120 men held out against Cromwell’s forces. Eventually, the Parliamentarian artillery breached the walls and the occupants surrendered. However, following the Restoration, Charles II appointed Lord Herbert, the son of William Herbert, as custodian. He kept a garrison at the castle. Chepstow Castle was used as a prison between 1660 and 1680. In 1690, the Crown ordered the castle to be dismantled and its guns taken to defend Chester. 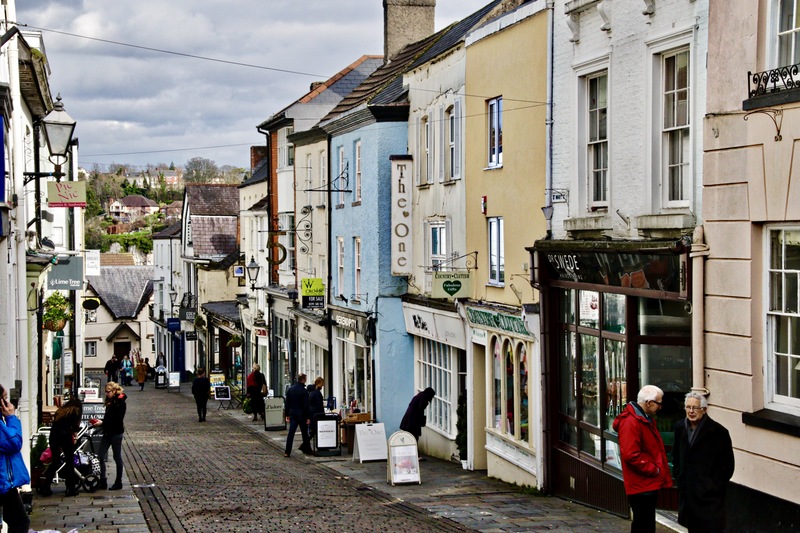 Today, Chepstow is a peaceful but thriving town, and well worth a visit. If you do go, wander around the street a while, and you’ll soon get your eye in for old town walls, old houses and other surprises. I’ve not even started in the old ship yards, iron works and spindle factories – that will have to be another blog. Then visit the Chepstow Museum, which has an eclectic collection of local history based in an old town house that has been a girls school and a hospital. I love these local museums. And of course ound it all up with a visit to The Three Tuns for great beer and a fantastic steak pie. I wonder if I’ll get a free drink out of this? Next Next post: Peacocks on the Beach.